An eyewitness account of Monday’s overtime victory at Staples Center. Whenever the Spurs come to visit Los Angeles, I am generally lucky enough to have one of my Lakers season ticket buddies invite me to the game. Monday night, that buddy was men’s basketball league legend Mike Ross. Super-son Pablo and his All-American wife Katie were also lucky enough to be gifted tickets, so we could sit together for the game between the Spurs and the “Fighting Lakers”. The Lakers are once again one of the more fascinating teams in the league, though they have now lost their first three games. Just like the Spurs, the Lakers have revamped much of the roster. Unlike the Spurs, who lost one of the top five players in the Association, the Lakers picked up one of the best, if not the best player, now and forever. Like the Spurs, the Lakers are struggling to put the pieces together on both ends of the court, with defensive and shooting issues dragging down both teams. Both teams also face the task of incorporating young and old, mixing veteran players with relative neophytes. The Lakers were without one vet (Rajon Rondo) and one youngster (Brandon Ingram) for the Spurs game because of suspensions arising from the scrum at the end of their previous game. (Side question – In a fight between Rondo and Chris Paul, is it OK to hope they both lose?) Rondo’s suspension meant the Spurs got to see a lot more of Lonzo Ball than they would have otherwise, as Rondo had been starting at point guard for the first two games. Spurs fans may remember that Ball had his best shooting game of his rookie season (admittedly a low bar) against the Spurs last season. Ball’s 4 for 7 on three-pointers led to an unexpected Lakers win in San Antonio last January. Last night, Ball almost repeated that feat with 3 for 7 on three-pointers. If he made one more three, Spurs would have lost. Whenever the Spurs play in L.A., Spurs fans take advantage of the opportunity to wear their Spurs gear into and around Staples Center. 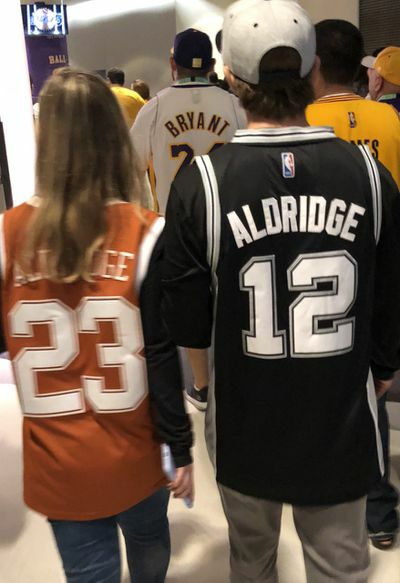 In the past several years, because the Lakers have been fairly abysmal, the number of fans in Spurs gear matched the number wearing the local purple and gold. 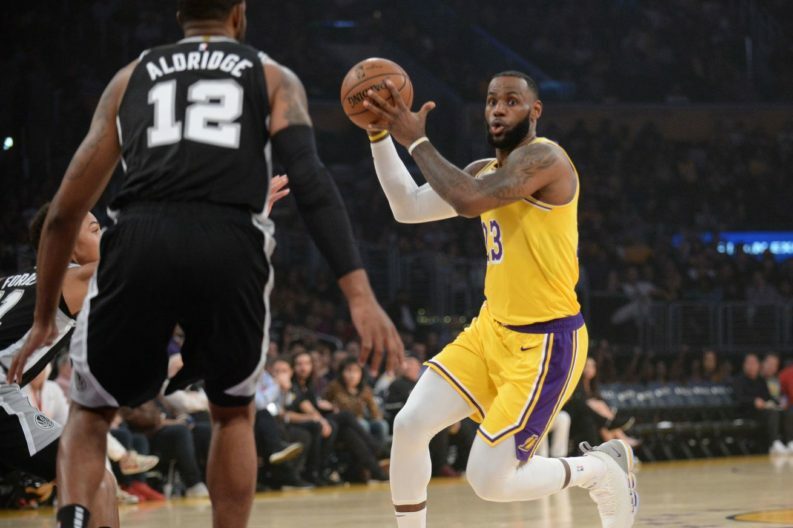 This year, however, the Lakers fans have been rejuvenated by LeBron James’s presence — which likely meant that fewer Spurs fans were able to get tickets. My very unofficial stats indicate that the 50/50 split from the last few years was closer to 95% Lakers gear, and 5% or less in silver and black. The number of people wearing Spurs Leonard #2 seems to have dropped to zero. Instead, everywhere one looks is James’ #23. 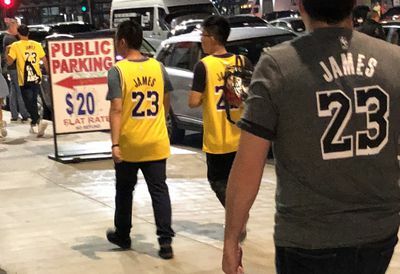 Waiting in line to get inside or for food, walking around outside or inside of Staples, in the seats, and in the bars around Staples, well over half of the Lakers gear is LeBron’s. Second-most is still Kobe Bryant (though down significantly from the last several years), third is Ball, and (somewhat surprisingly) very few with the Lakers’ second best player: Ingram. Though maybe his jerseys were suspended for last night’s game too. On the court too, everything revolves around LeBron. In the first half, his passiveness seeped into the rest of the Lakers, helping the Spurs take the big early lead. And of course, LeBron’s three-pointer to send the game into overtime, his missed free throws at the end of OT to give the Spurs a chance, and his missed jumper at the buzzer that gave the Spurs the win. All of this sent this Spurs fan home happy, while the rest of Staples Center watched in stunned silence. A remarkably exciting game between teams who will likely be fighting for the two of the last few playoff spots throughout the season. After the game, a friend who was also at the game texted me: “Pop had to have a tough night’s sleep with that defensive effort last night.” My response: “Yup, both teams shot over 50% before even accounting for 3 pointers. The Spurs have even introduced the ‘No D 5’, with Patty Mills, Bryn Forbes, Marco Belinelli, Davis Bertans and Pau Gasol. I looked up and realized that Mills is probably the ‘stopper’ in that group.” It sure would be nice to have a 3-and-D guy to throw in with that group. You know, like Danny Green, who is averaging 14.9 points and shooting 43% from three for an undefeated Toronto team. That being said, the Spurs finally shot the ball well from three last night. Every Spur who shot a three-pointer made at least half of them, except DeMar DeRozan. Since DeMar had 14 (!) assists, we will forgive him his 2 for 5 from three. Normally, when you watch a team warm-up, the players seem to make every shot. Perhaps foreshadowing his less than 50% shooting, DeMar’s warm-up last night included a stretch in which he missed at least 5 consecutive corner threes, none of them close. Maybe that is when he decided to focus on dropping dimes. The Spurs scored 143 points on 97 shots from the floor. I don’t think Luke Walton slept any better than Pop, although Luke’s complaints about the Lakers not getting enough fouls called ignores the stats. While the Spurs did shoot more free throws, they were called for 26 fouls compared to the 29 called against the Lakers. Not enough of a disparity to justify the fine Luke will likely pay as a result of his post-game comments. Traditionally, teams’ back-up centers have been strong defensively, but weak offensively. As the game has changed, the back-up centers are now often stretch 5’s who are not great defenders. LaMarcus Aldridge will destroy those guys on the block, as he did last night. Which surely made this couple very happy.